Sod cutter (lifts the grass up like a carpet) Mine cost $90 for the day, but well worth the price. If you prefer the greener way, a spade. Here is an article on how to use a shovel. Unfortunately, I tried this for about an hour and gave up. I am not strong enough to battle field grass. A heavy duty tiller if you are creating a veggie garden or a shovel to just put in plants. See my article about creating a new veggie garden. So what happens if you just don’t need the bed now but are thinking about it for next year? Why not try the no till method? Let nature help. What do you need? So, where do you get them? Your best bet is a mom and pop appliance store, liquor store, or other small store. In addition, go to your local recycling center and take it out of the recycling bins. My favorite cardboard boxes were the appliance boxes since I did not have to layer them. One cut down the side and instant area coverage! Once you put down the cardboard, I put a layer of 5 sheets of paper. Where do you get newspaper? I steal it from my neighbors on recycling day or I go to the recycling center and take it out of the bins. Sometimes, I wait at the recycling center and people who drive up to deposit their recycling often times have it bundled up in a bag or twine so it is easier for me to put in my car. They often give me a weird look like why does she want all of this paper. What do I use the paper for? To suppress weeds in the garden. I never used the colored circulars, and it ends up back in the recycling pile. 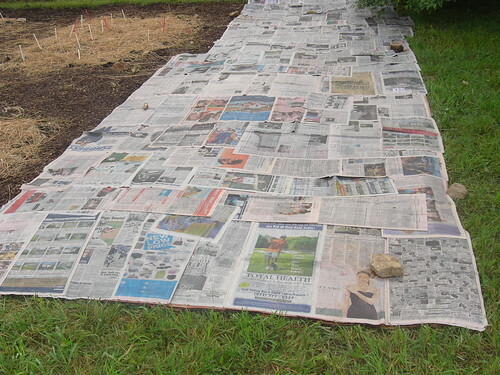 Newspaper is really good for weed suppression for about 2 years and then you need to rack back the mulch and reapply the paper. When I put it down, I wet the paper so that it does not fly away while I am doing something else. 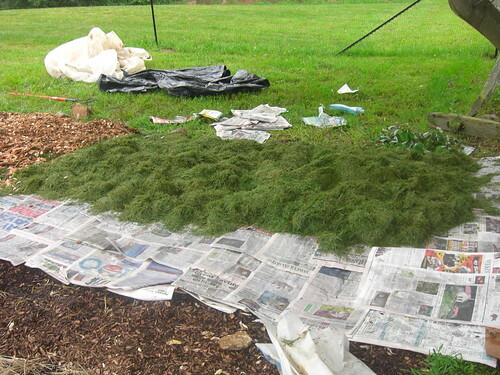 Paper dries within a few hours if it is sunny so don’t think you can paper one day and mulch the next. After both the cardboard and paper are down, I add grass. Again, I thought, no big deal. Everyone has grass. With new mulching lawn mowers, people leave the clippings on their grass to decompose. It is really good for the grass. So, where would I find grass? I was lucky because my neighbor has an old lawn mower and bags his grass. He throws at the end of his property in a pile. Decomposing grass is the best! Unfortunately, I ran out of grass and there is where the aggravation set in. I would go to the recycling area and look every day to see if anyone dumped off their grass. Yes, I had to scoop it up by hand into my garbage cans. You could call around to local lawn services to see if any of their customers have their grass bagged. I did make those calls but no one called me back. Perhaps, catching the local lawn services while they cut grass might be an option as well. As I would wait at the recycling center, I would ask everyone if they had grass. Most people asked me why I need grass since they just could not figure out why I would want it. I would explain that I was creating a mulched bed. Most had no idea what I was talking about and just went on their business and others asked me what that was. I needed a videotographer to film these interactions since some were priceless. On gentleman was kind enought to bag his grass and leave them for me at the recycling center with my name on them! Talk about community cooperation! By the way, as grass decomposses, it puts off alot of heat so be careful about using it near your plants as mulch. Here was my dilemma. What was I going to use to put on top of the grass so it would not blow away while it decomposed? I could not find an abundance of leaves to use. In retrospect, I should have stock pile leaves in the Fall to use as the last layer. During my layering process, I heard the sounds of trees being chipped. The light bulb went on and I ran over to see what the tree company was chipping. I asked my neighbor if they spray their trees and she said no. The tree service was more than happy to give me the chipped up wood for free and dumped it on my driveway. I put a layer of tree chips on top of the grass. I am a little skeptical of how long the tree chips will take to decompose. A public works supervisor in my town told me that the heat of the grass will help them decompose. Anyone have thought about the wood chips as a layer? He suggested putting a layer of leaves on top of the chips in the Fall. 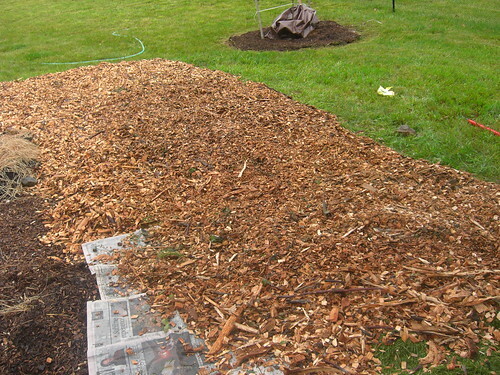 I think I will also put a layer of grass on top of the wood chips in late September followed by the leaves to help speed up the decompositon of the wood chips. Since grass is not the easy to come by, I might have to start stock piling it in the corner of my lawn for September. Decomposing grass is not the most pleasant smelling. Otherwise, I will have to find a lawn service who will give me grass. Some of you might be thinking, how do you know if the grass has been sprayed? This is a good point. Since I am only making shrub and perennial beds, this does not matter to me. It would matter if I was making veggie beds. I don’t know if pesticides break down in the compost stage. Anyone know? So, have any of you made beds out of mulched materials? How do you create new beds? It’s Gardening Time! Roll out the Compost! How Can Brown Turn to Green? Spring Garden Maintenance Checklist. Get Started Now. Do You Need a Vacation before the Vacation? I think that from a lot of flowerbeds grow plants that you plant it! I generally do not like digging in the ground so that it is not interesting for me! look at your beautiful garden – wow!!! I find this a pretty complicated process. I’m not sure if I will be willing to go through the hassle of making this same mulched bed. I also don’t think I can find “donors” for grass, chipped wood, newspapers and cardboards where I live. Anyway, I did enjoy this post. At least it has taught me something new today. I look forward to more posts from you regarding more garden landscaping ideas and other things green. couldn’t you use hay instead of grass? Seems like you could buy that for a reasonable price. it’s not free, but it’s not as expensive as buying dirt for a raised bed. Wow this incredible article is a must read for all home owners in Las Vegas and the entire strip. I am sure you are aware of the lawns in-front of home and in the backyards. Every household has one and I bet this article will save a lot of bucks and time for them. I am highly thankful to you for letting us know the existence of a phenomenal idea. .-= Green Valley Homes´s last blog ..Commercial Real Estate Bubble =-. Lately I uploaded a new article page about no till sheet mulch gardening, lasagna gardening, after I learned that it’s anti-green living in regards to off the property. Sort of made me feel more proud about having just mulched and controlled weeds all these years without the paper and cardboard. Absolutely. I grow in beds full of mulch, compost, and manure. It’s a hot soil mix for sure, but it’s very productive for basic veggies and most wildflowers (bee balm, etc). I’m toying with the idea of going to no-till this year. Mostly because I had a bumper crop of field peas and I want to keep every ounce of saved nitrogen right where it is! Hi Anna, Have meadow to convert to garden. I put down 1 layer of cardboard from a local winery then our local Garbage Company’s Compost delivered onsite for $7/ yard. Results were better than expected. No weeds. Great plant growth. I got my cardboard from the local bike shop! the cardboard is very heavy and each box covers a huge area. I’m converting a previously tilled garden to no-till; my “lasagna” is simply cardboard, straw, and last year’s muckings from the chicken run, which also has lots of worms. So I’m going to plant it this year, by poking holes through the cardboard for each seedling tomato. The peas and potatoes are already in. BTW, I’m in SW Ohio. the whole garden is planted in composting wood chips, and hardly needs watering, even in dry spells, as decomposing wood retains water. Check it out! We regularly mulch our garden with newsprint–except for the colored pages because of the ink chemicals– and also cardboard when we can get it, then top with a 12″ layer of leaves. It settles to 6″ shortly, do not blow away, and make a tidy garden, keeping paths clean and veggies off the ground. It cuts down on watering and weeding, even in our prolonged drought. We add leaves as they settle through the growing season. The paper and leaves will quickly compost in place in our heat, and we find hand-sized pieces of paper when we start cleaning up the summer garden and putting in our winter root crops in the fall. We find lots of earthworms have been working under the mulch. We are also trying not to till, or compress the planting beds by trampling on them. We do till up new sod, as our gumbo soil hardens like clay when dry. The composting-in-place for years has given us loose, crumbly soil with a lot of worms. I should mention that we are slowly transitioning soaker hoses out, and adding more drip systems each year, BEFORE we mulch. We also leave about 6″ around each planted seedling free of mulch until the plants have grown thick stems and are producing. Mulching too close to the veggies will suffocate them along with the weeds. For the flower beds we cover the newspaper and cardboard with pine straw, which slowly acidifies our alkaline soil as it slowly decomposes. We have learned not to put pine straw up close to the house, as in our area it can draw termites. Thanks for the ideas, enjoy learning new ways.